I currently work as a preschool teacher at a small, but growing, school. 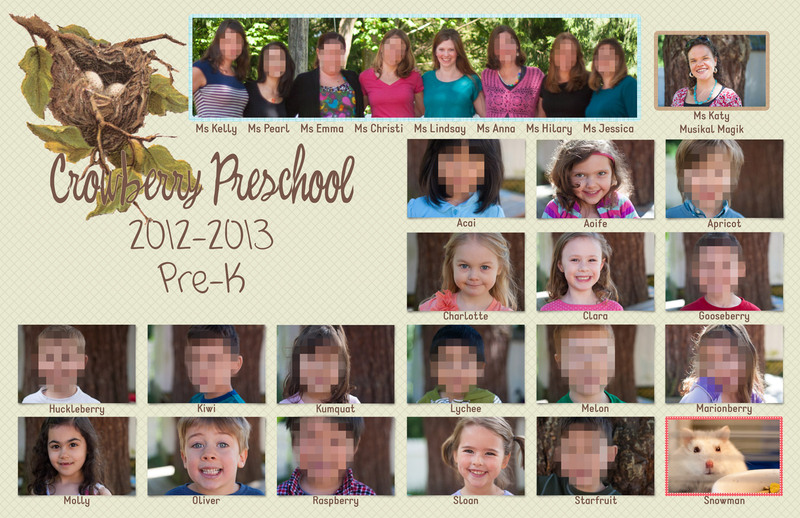 At the end of every year we like to send off the kids with a laminated placemat filled with all of their pictures. When I joined the staff, I took over the design process for these, including the pictures themselves. Though in the beginning I did not want to stray too far from the look of the prior placemats (which had a sort of scrapbook feel), or from the school’s logo (which used the French Script typeface), by the third time around, I managed to take it somewhere new, while still tying it directly to our school. I took inspiration from our new Rainbow Room, an art room which I had painted and set up a few months earlier. I used the blue Rainbow Room walls for our backdrop, and in order to give the placemat a rainbow feel, without being an actual rainbow, I asked each child their first and second favourite colours, which they got either on their name, or on the side border of their picture. The various bird icons represent our three different age groups: chickadees, hummingbirds, and owls. 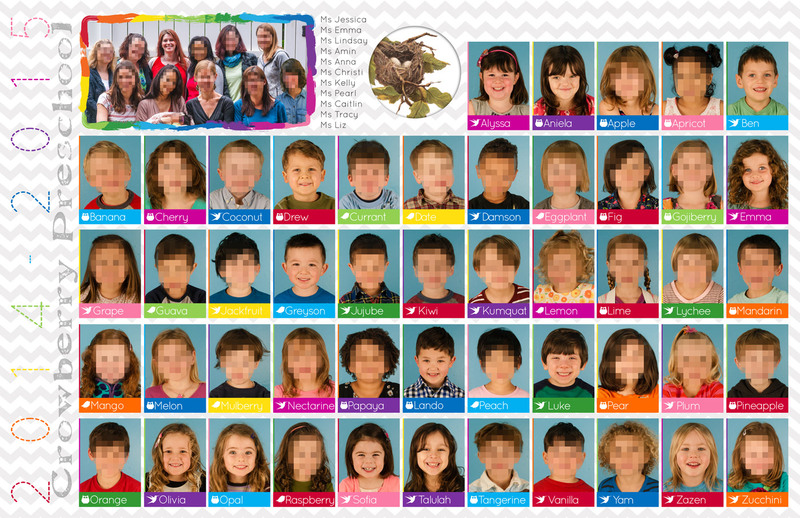 This was the first year we had these names for them and it worked brilliantly for indicating their class while keeping them ordered together. Here below, I include the two previous years’ placemats. And yes, the school name has been changed, which does affect the overall looks slightly. 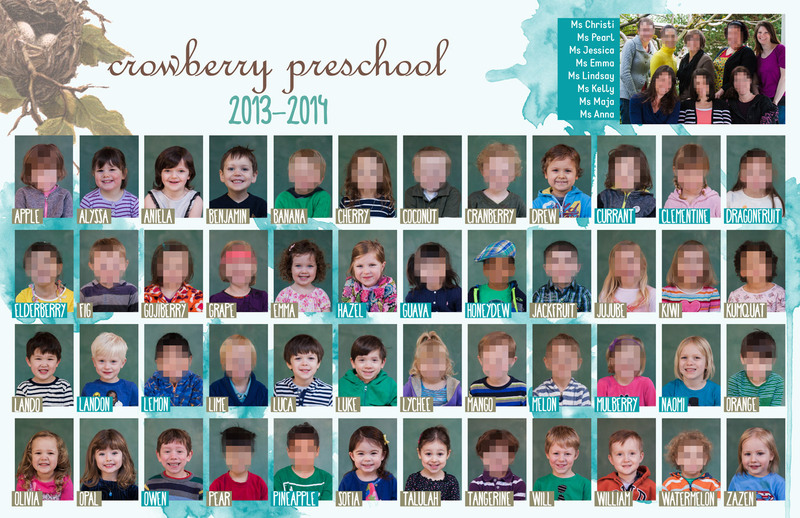 In the second year I used colours on the names to indicate the child’s class (preschool or pre-k) and in the first year, the placemat was two-sided, owing in part to the landscape orientation of the photos. Although this meant there was room for the inclusion of the class pet! *Unblurred photos used by permission, and only to show a sampling of the photography work. Thank you parents!